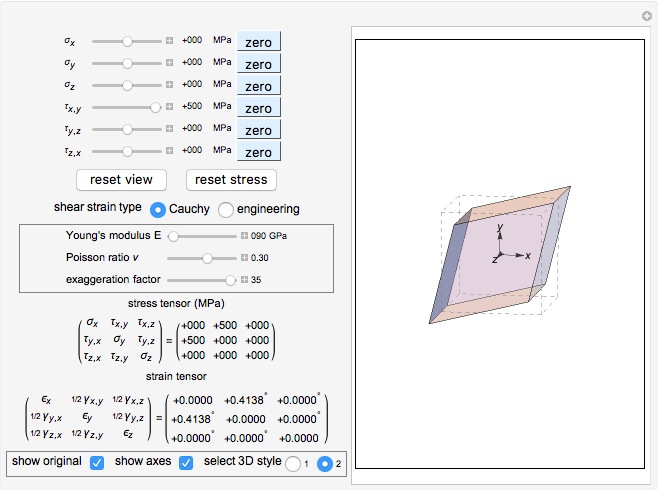 Given a unit volume of an isotropic material represented by a 3D cube, applying normal and shear stresses leads to the strain deformation of both Cauchy and engineering shear strain types. 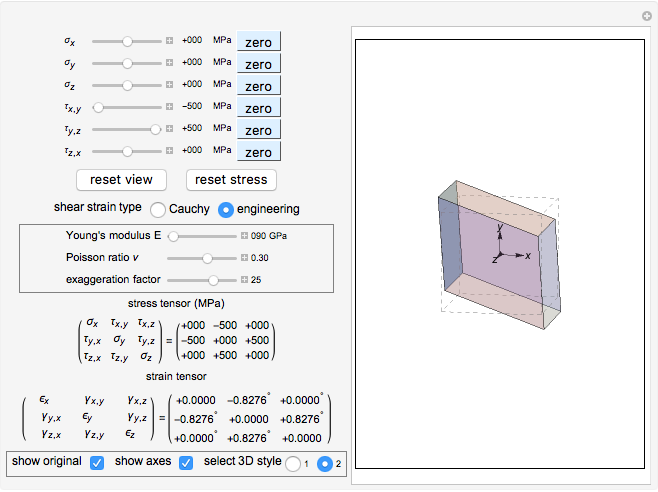 The stress and strain tensor is updated dynamically with the stress levels, and as you vary the material's modulus of elasticity and the Poisson ratio. The units for stress are in MPa (megapascals) and the unit for is in GPa (gigapascals). 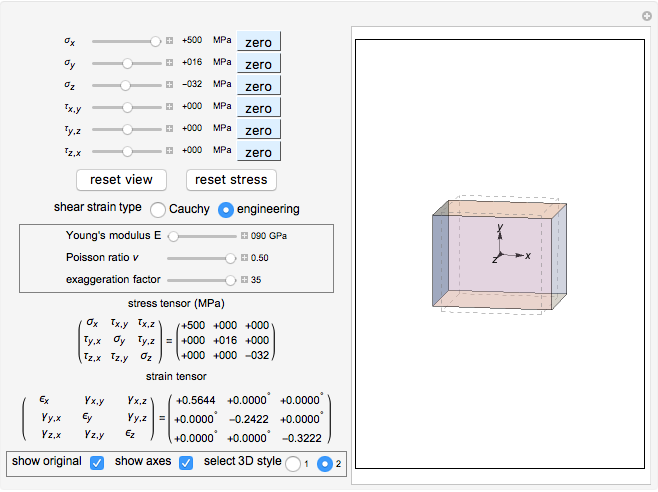 Shear strain values in the strain tensor are converted from radians to degrees for convenience. Direct strain is given as a percentage. Positive stress is tension and positive strain is extension. Since actual strain deformation (direct and shear) is too small to observe using realistic scale, the exaggeration slider multiplies the actual strain by a factor. This is only for display purposes and does not affect the values shown in the tensors. Setting the exaggeration factor to 1 shows the actual strain. Mouseover the cube for a better view. You can use the buttons to remove all stresses to return to the original configuration. A. C. Ugural and S. K. Fenster, Advanced Strength and Applied Elasticity, New York: Elsevier, 1987. Efunda. "Infinitesimal 1D Strain." (Sept 9, 2013) www.efunda.com/formulae/solid_mechanics/mat_mechanics/strain.cfm. Wikipedia. "Infinitesimal Strain Theory." (Jul 25, 2013) en.wikipedia.org/wiki/Infinitesimal_strain_theory. Nasser M. Abbasi "Cauchy and Engineering Strain Deformation in 3D"